The 2017 Honda CR-V is a versatile SUV, with all kinds of features, great fuel economy both in the city and on the open road, and a comfortable interior with lots of cargo space. The standard radio features and available infotainment tech like HondaLink will keep you and our kids happy and get rid of driving distractions every time you get behind the wheel, so check out the new Honda CR-V today! The 2017 Honda CR-V is offered in five trims: LX, EX, EX-L, EX-L Navi, and Touring. All trims are available with either 2WD or AWD. The 2017 Honda CR-V comes standard with an efficient 2.4-liter four-cylinder engine and CVT with impressive fuel economy at 33 mpg on the highway* and 185 horsepower. The EX trim replaces the 2.4-liter with a 1.5-liter turbocharged engine, boosting the horsepower a bit to 190 and improving fuel economy to 34 mpg highway, which is standard on all trim levels besides the LX. All trims come with a CVT with Sport Mode. The CR-V comes standard with useful features like a 60/40 split rear seat and illuminated steering wheel controls for audio and phone, and higher trims add features like illuminated vanity mirrors, push button start, leather accents, steering wheel navigation controls, and more. Standard Remote Entry makes the CR-V a convenient choice for busy parents, and the available LED daytime running lights and other advanced lighting accents along with the moonroof in the EX trim add to both its safety and style. The EX-L’s roof rails and the Touring’s power tailgate make the CR-V a perfect SUV for traveling, and integrated turn indicators and heated mirrors add to its safety. The CR-V comes standard with Bluetooth HandsFreeLink and Pandora, and higher trim levels get you a 7-inch Display Audio on the EX trim, SiriusXM Radio on the EX-L, and satellite-linked navigation with voice recognition and digital traffic updates on the EX-L with Navi. The Touring trim comes with a range of driver assist features including Lane Keeping Assist System, Adaptive Cruise Control, Collision Mitigation, and more. The CR-V has plenty of standard safety features, including Vehicle Stability Assist, Brake Assist, TPMS, a multi-angle rearview camera for easy parking, and more. The 2017 Honda CR-V has all the safety features you need and all the convenience and infotainment tech you want in a family SUV. 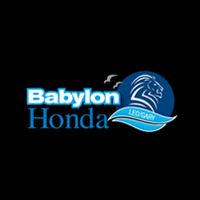 Take the 2017 Honda CR-V for a spin today at Babylon Honda in Babylon, NY!